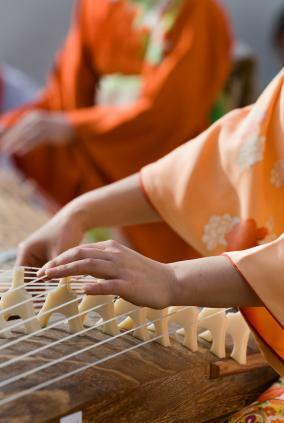 Music is an integral part of the culture in Japan – the country is the second largest consumer of music in the world. By and large, the music that makes the most impact in Japan is traditional Japanese music performed by Japanese artists. Although Western instruments and influences have infiltrated some traditional Japanese styles, there are still stark differences in musical approach between Western and Japanese traditional music. The most prominent difference between Western music and Asian music is that Asian music generally lacks any discernible beat. In Japan, the traditional music tends to be very smooth and calm. In most cases, the music is improvised, though there are some traditional compositions and lyrical ballads that have been passed down orally. Gagaku is a classical form of music that originated in the Imperial Court since Ancient times. It is considered the oldest form of Japanese music. Gagaku can be divided into two sub-categories: kangen, which is purely instrumental music, and bugaku, which combines the music with dance. Gagaku borrowed heavily from traditional classical music in China and Korea, passed back and forth between the cultures via trade. The music performed in kabuki shows is usually bugaku. Biwagaku is a general term used to describe music performed using the baku – a four-string, short neck cross between a lute and guitar. One of the most common forms of biwagaku is biwa hoshi – a genre of music that combines biwa with storytelling. Biwa hoshi performers are also called biwa hoshi. The most famous biwa hoshi story is "The Tale of The Heiki," which tells the tale of the 12th century defeat of the Tairi clan by the Minimoto. Many biwa hoshi were blind men and women. The women in particular traveled around playing the biwa and telling ghost stories. Like Biwagasko, taiko refers to both an instrument and a musical genre. Taiko is a large drum that sits on a slanted platform while the musicians beat it. Taiko music – or drum music – is sometimes performed by individuals and sometimes by drum ensembles called kumi-daiko. Taiko music can be divided into many subgenres, but it is especially important in Buddhist and Shinto music, where it is accompanied by religious chants. There are also many Chinese influences in Taiko music. Nohgaku is the music of Noh theater, which dates back to the 14th century. In Noh theater performances, the actors wear masks and deliver both dialogue and lyrics in monotone voices. Noh music consists of a repetitive chorus, the Hayashi flute and Tsuzumi drum. Performances are held outside under a roof supported by four single columns. In modern times, instruments like synthesizers and electric guitars have made their way into this traditional genre. Traditional Japanese music is still performed most often in the live setting, but there are recordings you can hear. Deezer has a large database of traditional Japanese music MP3s.